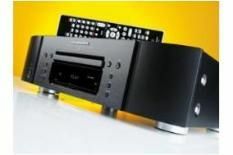 Marantz UD8004 review | What Hi-Fi? These days, A reasonably decent player costs around £100, and an excellent one isn't much more – so why spend nearly £2500? Marantz's chunky new UD8004 may not be 25 times better than a Sony BDP-S360 (pretty hard to measure, to be fair), but such crude arithmetic is irrelevant: what's clear is that the UD8004 is transparently, almost transcendentally superior to any cheaper Blu-ray player you might care to mention. The '8004 has been designed as a more affordable model to sit below Marantz's flagship £5000 UD9004. Like that player, it can cope with Blu-ray, DVD-Video, DVD-Audio, SACD and CD, plus a variety of digital file formats loaded via SD card. It's heavily built, if not quite as lavishly constructed as the '9004, and predictably, top-quality components litter its layout. Video processing is by Anchor Bay's ABT2010 chip, which provides powerful deinterlacing, scaling and image enhancement, while Analog Devices supply ADV7340 2-bit/297MHz video DACs. Together, these ensure the UD8004 delivers a thrilling picture: every aspect, from colour vibrancy and black-level uniformity to overall clarity and detail, is superb. The Hurt Locker's noisy long shots display gritty attention to detail and commendable stability, while punchier transfers, such as Pixar's Up, are stupendous to behold. But if that's impressive, the Marantz's sound is just wondrous. It's here that it asserts its clear superiority over both budget and mid-priced kit: whether you're revelling in the power of a DTS-HD surround mix or captivated by the emotional realism of a stereo SACD, the UD8004's clarity and power will stun. With a 32-bit SHARC chip to handle surround decoding, plus 24-bit/192kHz Burr-Brown DACs on all channels, there's no shortage of tech cred. Even so, it's occasionally hard to credit the sonic superiority of this player over cheaper rivals. Naturally, the pricier UD9004 is even better (as it ought to be), But the '8004 costs half as much, and will be more than adequate for most systems. Until 3D-ready players hit the UK, it's as good as it gets at the price.